Many of Vermont's trees stand dormant and barren-branched through the cold months, while the evergreens need nothing to enhance their seasonal picturesqueness. What's an arborist to do come winter? And what does an arborist do, anyway? To both questions, the answer is "Quite a lot." 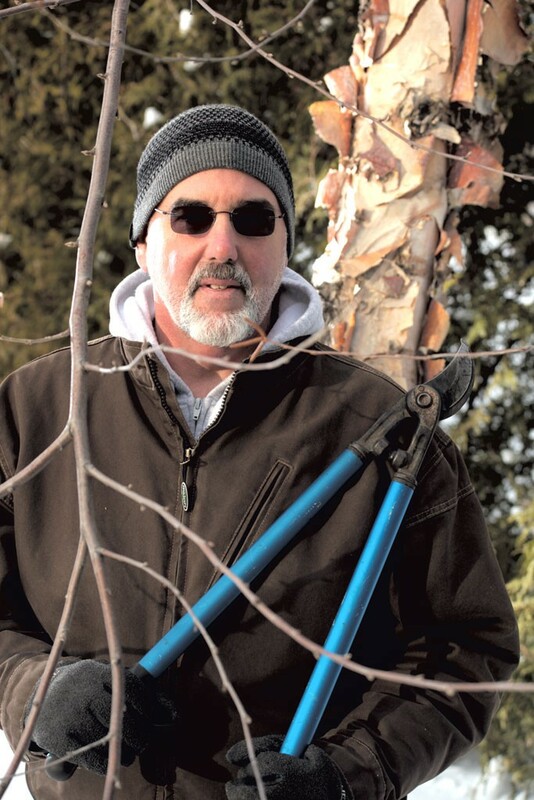 Warren Spinner, who's been the Burlington city arborist for 34 years, says he and his crew are outside even in the coldest months, pruning away; warmer weather brings the high season of planting. Year-round, Spinner catalogs and manages an "urban forest" of more than 11,000 trees. He's also the volunteer tree warden for his town of residence, Essex Junction. On a frigid day of comparatively slow arboreal activity, Spinner, 60, encouraged Seven Days to think about trees in ways we never had before. SEVEN DAYS: How did you get this job? WARREN SPINNER: I went to school for arboriculture and park management at UMass-Amherst, then worked for a private tree service for three years, but I always wanted to become a municipal arborist. And I wanted to stay in Vermont, if possible. So it was really limited. Even today, there are only three full-time arborists in Vermont — in Rutland, South Burlington and here — who are actually employed by a community to manage its vegetation. SD: What does a municipal arborist do? WS: I manage all aspects of that vegetation: the planning, the planting, the maintenance and aftercare of a tree, nurturing it from out of the nursery to maturity. I'm talking about the trees between the curbs and sidewalks — the "greenbelt" area — as well as those in city parks, cemeteries and other public rights of way like the bike path. My chief responsibility is to make sure that the city's vegetation is safe, so that the trees are healthy. The safer you can make your trees, the more apt they are to make it through catastrophic weather events. We're also always on the lookout for invasive pests like the emerald ash borer and the Asian longhorn beetle and a few others. We always have our heads in the trees. WS: I work with two budgets: the general fund (about $180,000) and the dedicated "streets, trees and sidewalks" tax, which gives me $190,000. Together, we get about $350,000 for the entire program: salaries, some vehicle purchasing, the cost of the trees. SD: What are the considerations that go into planting a tree in an urban area? WS: I look at how disease- and insect-resistant they are, how they do in poor soils, how they handle soil compaction, low moisture. It really reduces the palette of trees that you have to select from. Your weedier, faster-growing trees, like the red-silver maple cross and elms, do quite well, so we're planting a lot of those in the downtown. Most people, when they're walking through their neighborhoods, are looking at the trunks and the tops of the trees. They don't understand what's going on below ground. The root systems and the soil volume and the conditions below ground are extremely important. The bigger the tree is, the larger its benefit for the community — I'm talking about stormwater management. We use Silva Cells, which are like building blocks that you put below ground. We can fill them full of 100 percent soil without compacting it, which would hinder root development; they also support the asphalt and concrete above them. SD: What kinds of data do you keep on Burlington's 11,200 trees, and how do you use that information? WS: You gotta have personnel. We have four full-time people; during the summer we'll hire up to five seasonal positions. The majority of our work to maintain these trees is pruning. When I first started here, we had a 10-year pruning cycle: Once every 10 years, I might get to that tree in front of your house. Now, we're at about a four-to-five-year cycle. We're pruning about 2,000 trees a year, and we prune all winter long. We also keep [digital] records on the trees' overall health, trunk diameters, where [each is] located, the width of the greenbelt, where the nearby utilities are, the species, the height, the spread, where we got the trees, and the trees' histories with disease and insects. We have data for all 11,000 trees. I can now actively manage all the trees and catalog all their histories. SD: How has climate change affected your job? WS: We're seeing the mean temperature in the world increasing, and I've been seeing it happen here over the last 10 or 15 years. As the temperature increases, it gets more demanding on urban trees that are planted in the greenbelt areas. Temperatures are warmer there because of the cement and asphalt. So we have to try to select the tree that'll survive best in those sites, and then have an aggressive follow-up watering program. SD: Besides pruning and data collection, what do you do in the off-season? WS: Winter is when you gotta plan for your spring planting. There's a lot of work to do with the inventory. We work with Branch Out Burlington!, which is a citizen tree group, and we established a nursery at the UVM [Horticulture Research Center]. We have an area where we actively are growing 400 to 450 trees. On the average, in the spring, we will take out 100 to 130 trees to plant in Burlington. At the same time — usually it's Green Up Day — we have our tree planting at the nursery, and we get 70 or 80 volunteers to replant. We'll also buy other local trees if we can. We save the city a lot of money that way. Warren Spinner will deliver Branch Out Burlington! 's annual winter seminar, "Burlington's Urban Forest: A Century of Change," on Sunday, February 15, 4 p.m., in Room 102 of the University of Vermont's George D. Aiken Center in Burlington. Free. The original print version of this article was headlined "Head in the Trees"